What towns does your practice serve? We are most convenient to patients from Westwood, Dedham, Norwood, and Needham MA. Additionally we serve Medfield, Dover, and the entire Boston area. If your teeth are discolored, tooth whitening may help. "Whitening" is any process that can make teeth look whiter. It may be safely done at home or in a dental office. Whitening toothpastes help remove stains on the surface of your teeth. They are the gentlest kind of whiteners. Since they work using polishing action rather than chemicals, they usually do not have side effects. However, they do not get teeth as white as chemical products. Whitening toothpastes can lighten teeth a little bit at a time, over days or weeks, and can be purchased over the counter. Home-use whiteners come from your us or are sold over the counter. They can be applied with trays, strips, a rinse, or a brush. They usually contain a chemical called peroxide, which gets below the surface to lighten tooth enamel. Home-use whiteners are meant to be used over days or weeks. It is best to consult your us before whitening your teeth. We may make special whitening trays for your upper and lower teeth. You put the whitening gel in the trays and wear them for short times during the day or overnight. We will tell you how long to wear them - if you wear the trays for too long, the peroxide in the gel can irritate your teeth. We offer in-office whitening using the Philips ZOOM! laser whitening system - your teeth can be up to 8 shades whiter after one 60 minute treatment. Click here for more information on ZOOM! teeth whitening. 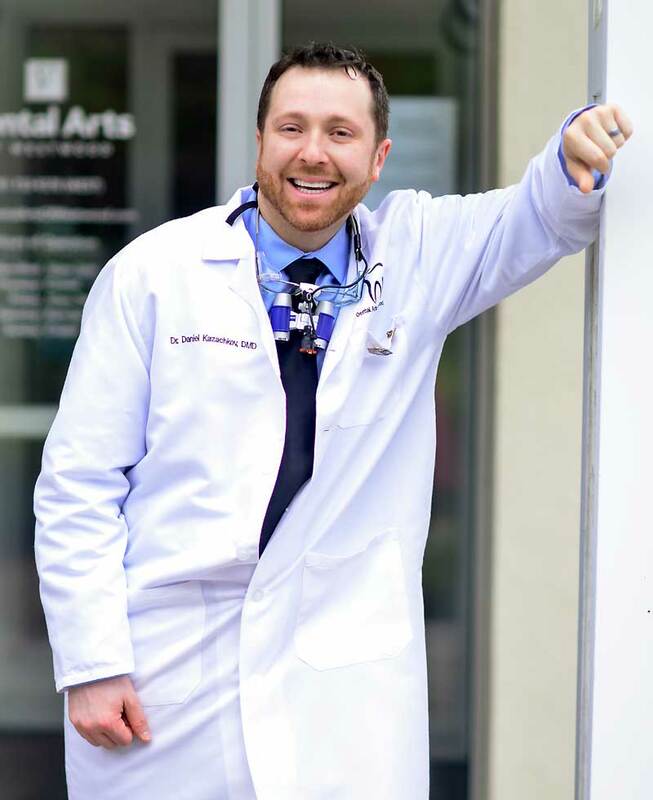 How can Dr. Dan help me get over my FEAR of the dentist? As discussed on About the Practice, as a small child Dr. Dan underwent a four hour root canal procedure with no anesthetic. Since that day, he vowed to never let that happen to anyone else, and dedicated himself to painless, gentle dentistry. Every aspect of our practice has been considered with your comfort in mind, and Dr. Dan will do his utmost to put your mind at ease. Why is brushing and flossing important? It's easy to keep your teeth and gums in good health. A simple routine of daily teeth cleaning, good eating habits and regular dental visits can help prevent tooth decay (cavities) and gum disease. Your teeth are covered with a sticky film of bacteria called plaque. If you brush twice a day and floss once a day, you can remove most of the harmful plaque and bacteria. But if plaque stays on the teeth, it will eventually harden into tartar. It is harder to brush and floss when tartar builds up near the gumline. Brush twice a day with a fluoride toothpaste to help prevent tooth decay. Select a toothbrush that feels comfortable in your hand and in your mouth. Replace your toothbrush every three or four months, or sooner if the bristles become frayed. If you have hand, arm, or shoulder problems that limit movement, you may find a powered toothbrush easier to use. Even if you brush twice a day, there are places your toothbrush bristles can't reach. Flossing removes plaque and food particles from between teeth and under the gumline. A simple routine of daily teeth cleaning, good eating habits and regular dental visits can help prevent tooth decay (cavities) and gum disease. If you have trouble handling floss, you may wish to try a floss holder or another type of interdental cleaning aid. Interdental cleaners include narrow brushes, picks, or sticks used to remove plaque from between teeth. Your dentist or hygienist can tell you how to use these special cleaners. What toothbrush and toothpaste do you recommend? Our current recommendation is the Sonicare Diamondclean toothbrush, and Colgate toothpaste. Why is my tooth sensitive or painful? There can be many causes for tooth pain, including dental decay, an injury or infection. If you have tooth pain, read on to find your symptoms, possible causes and treatment options. If you have ongoing pain or discomfort, please contact us. Momentary sensitivity to hot or cold foods. If this discomfort lasts only moments, sensitivity to hot and cold foods generally does not signal a serious problem. The sensitivity may be caused by a small decay, a loose filling or by minimal gum recession that exposes small areas of the root surface. Try using toothpastes made for sensitive teeth. Brush up and down with a soft brush; brushing sideways wears away exposed root surfaces. If this is unsuccessful after several days, come see us. Sensitivity to hot or cold foods after dental treatment. Wait two to four weeks. If the pain persists or worsens, come see us. Sharp pain when biting down on food. There are several possible causes of this type of pain: decay, a loose filling or crack in the tooth. There may also be damage to the pulp tissue inside the tooth. Come see us for an evaluation. 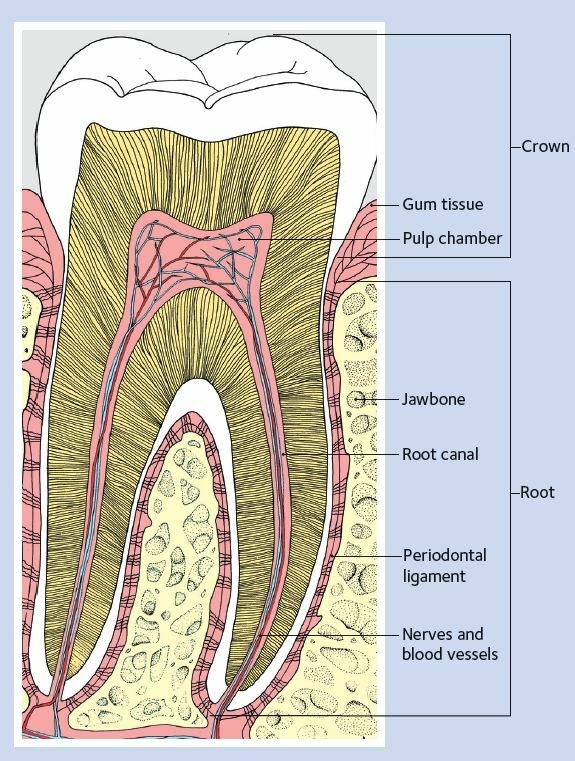 If the problem is pulp tissue damage, you may need a root canal. This is a procedure that cleans out the damaged pulp and fills and seals the remaining space. Lingering pain, typically lasting more than 30 seconds, after eating hot or cold foods. This probably means the pulp has been irreversibly damaged by deep decay or physical trauma. See us to save the tooth with root canal treatment. Constant and severe pain and pressure, swelling of gum and sensitivity to touch. A tooth may have become abscessed, causing an infection in the surrounding tissue and bone. See us for evaluation and treatment to relieve the pain and save the tooth. Take over-the-counter medications until you see us. Why do my face and temple area feel sore in the morning? Why does my jaw click? Information about tooth grinding. Dry mouth - also called xerostomia - results from an inadequate flow of saliva. It is not a disease, but a symptom of a medical disorder or a side effect of certain medications, such as antihistamines, decongestants, pain killers, diuretics and many others. Saliva is the mouth's primary defense against tooth decay and maintains the health of the soft and hard tissues in the mouth. Saliva washes away food and other debris, neutralizes acids produced by bacteria in the mouth and provides disease-fighting substances throughout the mouth, offering first-line protection against microbial invasion or overgrowth that might lead to disease. Some of the common problems associated with dry mouth include a constant sore throat, burning sensation, trouble speaking, difficulty swallowing, hoarseness or dry nasal passages. In some cases, dry mouth can be an indicator of Sjögren's (pronounced SHOW-grins) syndrome. Sjögren's syndrome is a chronic autoimmune disorder in which the body's immune system mistakenly attacks its own moisture-producing glands, the tear-secreting and salivary glands as well as other organs. For more information, visit the Sjögren's Syndrome Foundation. How can I improve my breath? Bad breath happens. If you've ever gotten that not-so-fresh feeling on a date, at a job interview or just talking with friends, you're not alone. Studies show that 50 percent of adults have had bad breath, or halitosis, at some point in their lives. Feeling parched? Your mouth might not be making enough saliva. Saliva is important because it works around the clock to wash out your mouth. If you don't have enough, your mouth isn't being cleaned as much as it should be. Dry mouth can be caused by certain medications, salivary gland problems or by simply breathing through your mouth. Bad breath that just won't go away or a constant bad taste in your mouth can be a warning sign of advanced gum disease, which is caused by a sticky, cavity-causing bacteria called plaque. Garlic, onions, coffee... The list of breath-offending foods is long, and what you eat affects the air you exhale. Brush twice a day and clean between your teeth daily with floss to get rid of all that bacteria that's causing your bad breath. Don't forget about your tongue when you're taking care of your teeth. If you stick out your tongue and look way back, you'll see a white or brown coating. That's where most of bad breath bacteria can be found. Use a toothbrush or a tongue scraper to clear them out. Over-the-counter mouthwashes can help kill bacteria or neutralize and temporarily mask bad breath. It's only a temporary solution, however. The longer you wait to brush and floss away food in your mouth, the more likely your breath will offend. Giving up this dangerous habit is good for your body in many ways. Not only will you have better breath, you'll have a better quality of life. If you're concerned about what's causing your bad breath, make an appointment to see your dentist. Regular checkups allow your dentist to detect any problems such as gum disease or dry mouth and stop them before they become more serious. If your dentist determines your mouth is healthy, you may be referred to your primary care doctor. What is gum disease? What is periodontal disease or periodontitis? Periodontal (gum) disease is an infection. It affects the tissues and bone that support the teeth. Healthy gum tissue fits like a cuff around each tooth. When someone has periodontal disease, the gum tissue pulls away from the tooth. As the disease gets worse, the tissue and bone that support the tooth are damaged. Over time, teeth may fall out or need to be removed. Treating periodontal disease in the early stages can help prevent tooth loss. Periodontal disease has been linked to some other diseases. People with diabetes or heart disease are more likely to get periodontal disease. Strokes and high stress also may be related to periodontal disease. Periodontal disease is caused by plaque, a sticky film that is always forming on your teeth. Plaque contains bacteria that can irritate and inflame the gums. Inflamed gums can pull away from the teeth and form spaces called "pockets." These pockets collect more bacteria. If the infected pockets are not treated, the gum disease can get worse. You can have periodontal disease and not notice any of these warning signs. That is why regular dental checkups are very important. Your dentist or hygienist may recommend using a germ-fighting mouthrinse or other products. Eat a healthy diet and limit snacks. Find out more at the website choosemyplate.gov. Visit your dentist regularly. If plaque stays on your teeth, it hardens into tartar (also called "calculus"). Professional cleanings are the only way to remove tartar, which traps bacteria along the gumline. Tobacco. People who smoke or chew tobacco are more likely to have periodontal disease. Diseases that affect the whole body-such as diabetes and AIDS-lower resistance to infection. If you have one of these diseases, you are at higher risk for periodontal disease. Many medications, such as steroids and blood pressure drugs, can affect your gums. Some have side effects that reduce saliva, which can affect soft tissues and make tooth decay more likely. Tell your dentist about all the medications you take and any changes in your health. Teens, pregnant women and those taking birth control pills face changes in hormone levels. These changes can cause gums to become more sensitive to plaque bacteria. Genes may play a role. If your parents wear dentures or you have a family history of tooth loss, be extra alert for changes to your gums. The bacteria that cause periodontal disease may be passed from parents to children and between partners through saliva. 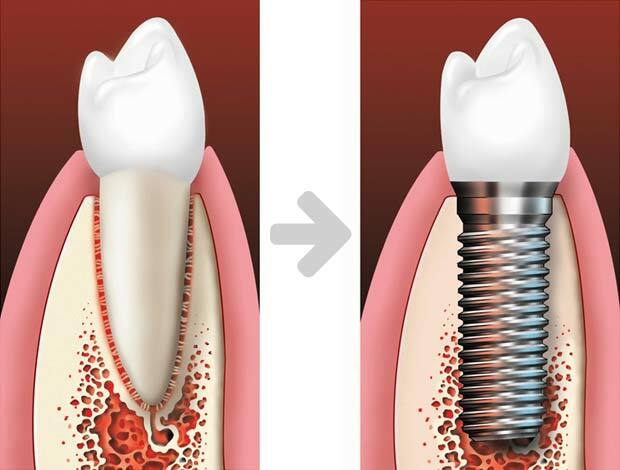 Many kinds of dental implants are available. Treatment can take one day, several months, or somewhere in between, and usually involves three basic steps. Your dentist will carefully locate where the implant should be placed, using x-rays or other pictures. Then the dentist surgically places the implant into the jawbone. 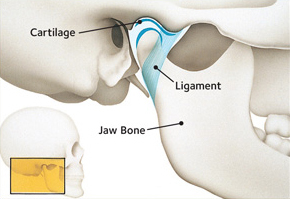 What makes an implant so strong is that the jawbone grows around it and holds it in place. This process, called osseointegration (OSS-e-o-in-te-GRAY-shun), can take several months before the implant is completely integrated into the bone. Then the patient can get the permanent replacement tooth or teeth. In many cases, the implant and temporary replacement teeth can be placed in one visit. Single tooth crowns, implant-supported bridges and dentures are all custom-made to look like natural teeth and to fit your mouth. The replacement tooth or teeth are attached to the implant post(s). What is that white line on my cheeks? The linea alba (Latin for white line) is a term used in dentistry to describe a horizontal streak on the inner surface of the cheek, level with the biting plane. It is a common finding and most likely associated with pressure, frictional irritation, or sucking trauma from the facial surfaces of the teeth. It may be found in individuals who chew tobacco, and may be mistaken for a lesion requiring treatment. In any case if you are concerned get in touch and we can schedule a consultation. How can smoking and tobacco use affect my oral health? Smokeless tobacco goes by many names, such as chewing tobacco, oral tobacco, spitting tobacco, dip, chew, and snuff. There is no such thing as a healthy tobacco product. Many non-cigarette alternatives are often marketed as healthier alternatives to smoking, but tobacco is harmful to your oral health and overall health. Quitting is the only way to decrease your risk of tobacco-related health problems. If more than 3 of the above questions pertain to you, it would be best to schedule a consultation appointment where we can discuss your case and examine your concerns. Reach Doctor Dan at the office at (781) 733-9378 or contact him via email. Simply paste your question into the subject line and body of the email along with your name and phone number. Providing your contact information will allow multiple or extensive questions to be answered on a more personal level.